This post is about a subject that’s very close to my heart. Food quality! Good food that’s fresh, high in nutrients, and free from toxic spray residues. Sadly, these are things we can’t take for granted in our world of industrial agriculture. And the main way we have of knowing whether food is good quality, unless we know and trust the producer, or have grown it ourselves, is through organic certification. Those of us who care about food need to get our heads clear about this issue. Organics isn’t just a hippy and/or middle-class indulgence. It’s about the quality of our food and our environment. And our health, and the health of our children, and our grandchildren. This post follows the trail that I’ve been on, in an attempt to get my thinking straight about organics. I’ll write about how and why I started buying organic food, and about some of the unexpected payoffs for my family. It’s my subjective opinion. You might look at the same information and come to different conclusions. I’ll also cover some of what I learned from the international scientists who spoke at the Food Matters Aotearoa conference earlier this year, about how even small traces of Roundup in food are killing human gut flora and causing chronic ill-health and cancer. Sorry folks, it’s scary stuff. (Well, I was scared.) But there’s a silver lining. We can do something about it. We can get more fussy about our food and how it’s grown. I’d rather do that now, and not wait until I’m sick. 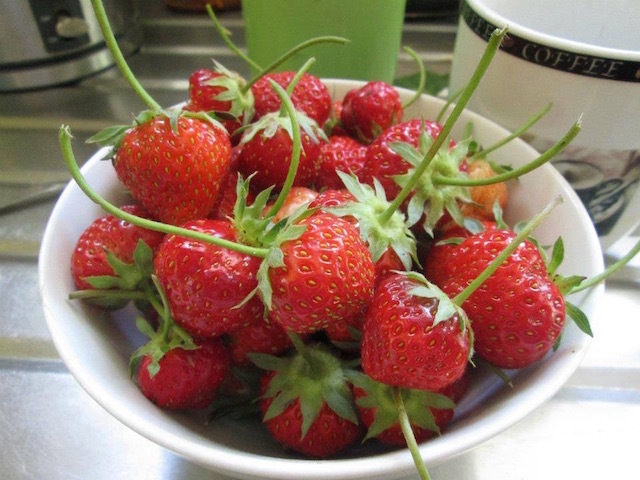 Freshly picked strawberries: when you grow them yourself, you know what’s in them. All photos in this post by Dani Edwards. I think organics is a key part of the local food system. 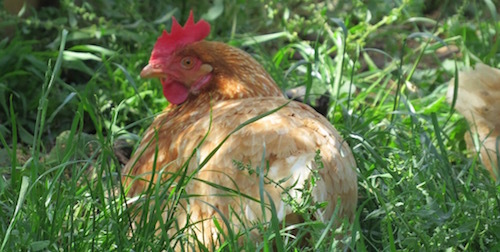 When we’re eating food grown locally, we have a closer connection to the producers, and can encourage and support those who are using sustainable, environmentally friendly, biological – and yes, organic – farming methods. It’s not an easy option for most growers, and having customer support is helpful. The most straightforward way to do this is to buy their produce. I believe we should be raising the bar of what we think is acceptable in agriculture and horticulture. I know that not every grower will want to (or be able to) aim for organic certification. But I’m going to celebrate those that do. Organic growing methods are better for the soil; better for the ecosystem, including waterways; produce food that’s likely to be higher in nutrients (because it’s grown in healthy soil); better for the health of the growers; and produce food that’s free from residues of toxic chemicals that mess with our hormones, cause cancer and create problems with children’s development (amongst other things). Organic farming could also make a real difference to climate change, according to Tony Banks, chair of the Waikato branch of Organic Farm NZ. Growing our own food is one way we can be sure what’s gone into it. But, realistically, many (most) of us need to buy at least some of our food. I don’t swallow the line of reasoning that says there’s no alternative to industrial farming, to feed the world’s population. There’s plenty of evidence worldwide that small family farms can be hugely productive without polluting the ecosystem or using high-tech crops. Besides, industrial farming is increasingly producing food that is lacking in essential nutrients and contains toxic chemical residues. My main experience of organic produce is as a consumer. Having chronic health problems in my mid-20s, and having two close family members dead of cancer at 60, meant I looked closely into possible connections between agricultural chemicals and illness. Organic food seemed like a good choice, when I could get it. When my sons were small they were fussy eaters. One day I was reading yet another “Dirty dozen” list of foods containing the highest pesticide residues – and most of those were in my kids’ embarrassingly narrow daily diet. I decided that buying organic was the most obvious thing I could do about this. If the only vegetables my sons would eat were carrots, tomatoes, cucumber and oven-fries, at least they would have the healthiest oven-fries I could give them. Des and Aileen’s veges were always excellent and sometimes a lot more than that. I’ve never eaten better cauliflowers. And along the way, some other things happened. It was great to have a box of food arrive on the doorstep every week without having to shop for it. I enjoyed the challenge of working out how to cook some unfamiliar vegetables – like leeks, kale and fennel. And we got used to knowing where our food came from. As a third-generation supermarket shopper (my mother is from Southern California) that felt strange at first. And in the process, my sons gradually grew into terrific young men who love good food and are great cooks. 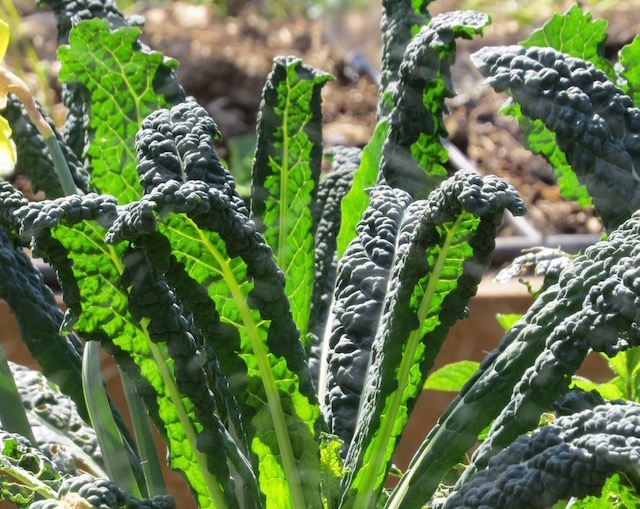 Cavolo nero – I had to learn what to do with this when it turned up in the vege box. When we moved to Hamilton, I started buying from the local farmers’ market. A small amount of the produce at the market is certified organic, some is grown using organic methods (I know this from talking to the growers), but not certified. And some is “spray free” – which really doesn’t mean anything, unless you trust the people who grow it. Quite a lot isn’t even claimed to be spray free. I’ve heard people saying, “Oh, I just assumed produce at the farmers’ markets would be organic.” Buyer beware, folks! Food grown in this country for export is rigorously tested for spray residues, but food that’s grown for New Zealand consumption isn’t as comprehensively checked (although the Ministry of Primary Industries does do tests). A veteran grower said to me recently that he wouldn’t eat fruit that he hadn’t grown himself, because of this. If you’re buying food, the only way to know that it’s free from spray residues is to buy certified organic – or buy from a grower whose growing methods you know and trust. Just about all the requirements under New Zealand’s food legislation are about food safety. There is virtually nothing about nutrition. Tony Banks is the chair of the Waikato branch of Organic Farm NZ, a grassroots organization providing low-cost organic certification to smallscale growers. He says New Zealand organic growing standards are about much more than avoiding using sprays and inorganic fertilizers. He says any food producer who is working to New Zealand organic certification standards will be using methods that feed the soil, and therefore will be producing food that is likely to be nutritionally superior to the products of industrial agriculture. Donald Nordeng, the CEO of BioGro, New Zealand’s main certification system for growers producing for national and international markets, has described New Zealand’s organic certification systems as “legacy standard” – meaning they are very rigorous and trustworthy by international standards. 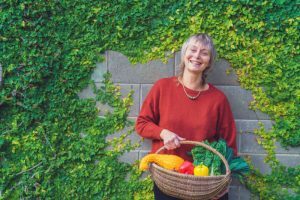 In the Waikato we can now get home deliveries of locally grown organic food from Ooooby, a non-profit business that aims to connect up consumers and producers of local food via food box deliveries. (Here’s a link to a post I wrote about Ooooby.) Ooooby also sell boxes of local but not certified organic produce, which are cheaper. Raglan residents also now have a local organic food box supplier, WOK (Whaingaroa Organic Kai) www.wokraglan.co.nz. “Spray free” isn’t good enough, if it means using Roundup. Earlier this year I went to a couple of public talks about food and health issues. For the Food Matters Aotearoa conference there was an array of international speakers including environmental activist Dr Vandana Shiva, who is one of my heroes (I was honoured to contribute a jar of apple chutney to her gift kete!) and Professor Gilles-Eric Seralini, the researcher who has linked low doses of glyphosate (the main ingredient in Roundup) with an increase in breast tumors. Another evening focused on “Children, Food and Health” and the speakers included American paediatrician Dr Michelle Perro, Dr Michael Antoniou of King’s College London School of Medicine, and the wonderfully named Zen Honeycutt of citizen activist group “Moms Across America”. 1. Roundup isn’t just a herbicide. It’s a broad-spectrum antibiotic that kills soil microbiology and also destroys human gut flora. “Roundup is the most broad-spectrum antibiotic I know of,” said plant pathologist Professor Don Huber. Dr Michelle Perro talked about the substantial mainstream medical opinion linking problems with our gut flora with a lot of chronic illnesses. And she said glyphosate is also a chelator, which disrupts our bodies’ ability to access many important minerals. 2. If you’re not really well informed about current research, you probably think Roundup is relatively harmless, compared with other agricultural chemicals, because it’s marketed that way. I often see people in my neighbourhood, spraying it on their gardens without wearing protective clothing. Roundup isn’t the only toxic agricultural chemical that is causing environmental problems – but it’s extremely common, and many people are still seriously underrating its impact on human health and the environment. 3. The third piece of information I gleaned from the talks is that Roundup isn’t just being used for killing weeds – it is now being used routinely for harvesting wheat, corn, soy, potatoes and other crops. It’s sprayed on the crops during harvest so the foliage turns brown. This technique is called dessication. I think humans are too stupid to survive, if we think this kind of agriculture is a good idea! The only way we can know that our food hasn’t been grown this way is to buy organic. I’m now buying certified organic flour for my husband to use in the breadmaker. It’s expensive, but at least I can be sure it hasn’t been drenched in Roundup. It’s hard to face the reality of this situation. But all is not lost. Professor Seralini said the solution can be as simple as eating clean organic food. “When you give nice organic produce to children, within one week they do not urinate pesticides. That means we can detoxify,” he said. The conclusion that I draw is that the sooner we get more growers practising organic farming methods, the better for our health and the health of our land.